Fantastic Voyage (Special Edition) - BUY THIS DVD! 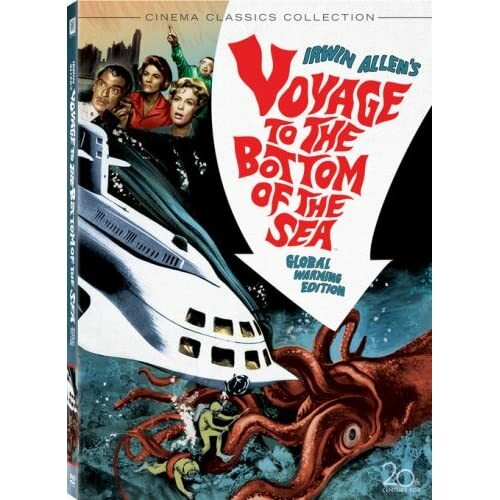 Voyage to the Bottom of the Sea (Global Warming Edition) - BUY THIS DVD! A routine scientific expedition to the North Pole turns into a race to save all mankind when a radiation belt in space causes a fiery inferno on Earth. Admiral Nelson (Walter Pidgeon) and the crew of the atomic submarine Seaview battle saboteurs, giant sea-creatures and attacks by enemy submarines as they race to prevent global catastrophe. Renowned disaster film producer, Irwin Allen, produces and directs an all-star cast including Joan Fontaine, Barbara Eden, Peter Lore, and Frankie Avalon. The stunning visual effects and breathtaking underwater photography make this one of the most respected sci-fi adventure classics of all time. THEN SEND IN YOUR NAME AND ADDRESS TO contests@efilmcritic.com or WeLoveHBS@aol.com. (Just one e-mail please.) Put "A ROUND TRIP VOYAGE" in the subject line and cross your fingers. We will draw names and one of the DVDs from Fox will be yours. Only 1 entry per household.